Brief Blurb: Silver Lining is a dynamic duo by veteran performers Amanda Gilmour and John Holmberg. Featuring Amanda’s sterling singing and song writing, and tight harmony singing by both, the repertoire spans varied musical terrain from Amanda’s heartfelt originals, to country male-female duets and bluegrass songs. Amanda’s guitar and John’s mandolin, mandola and clawhammer banjo fill out the rich musical landscape. Amanda and John were part of the four piece Fallen Angels in recent years. John was with Pirate Brides for 12 years until recently. 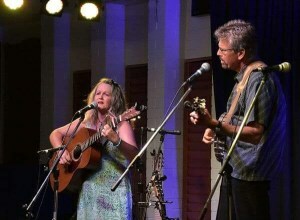 Amanda has a long list of music associations and awards for her singing and song writing, including years as lead singer with the popular country band, Blue Healer band. Finding themselves nearby on the Sunshine Coast and Hinterland has engendered this renewed musical association and shared joy of performing.